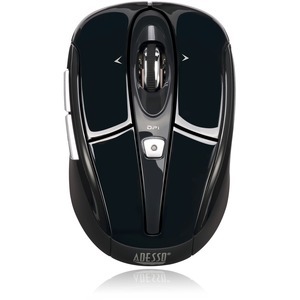 Experience new levels of productivity with the Adesso® iMouse S60 2.4GHz Wireless Programmable Mini Mouse. This advanced wireless mouse offers you up to 30 feet of wireless freedom and eliminates the constraints that wired mice often cause. Its optical sensor tracking method lets you work on most surfaces with better speed and accuracy. In addition, the mouse includes a built-in DPI resolution of 800/1600 for precise navigation and fast maneuver. On top of these features, iMouse S60 is also fully programmable. Combined with its reliability and portability, the iMouse S60 is your perfect peripherial companion. The 2.4GHz Wireless Technology has 65536 IDs with 12 channels and works up to 30 feet. This provides the reliability to ensure your other wireless devices will not interfere with your keyboard. Simple and easy to use, the driver covers virtually all ranges of different applications. From basic multimedia commands to Windows® related functions, it will satisfy both your entertainment and work needs. If that's not enough, you can also set your own commands (macros), all with just a few simple steps. With the 4 way tilting wheel, users can scroll vertically and horizontally, which makes browsing through different documents a breeze. (Tilt Wheel PC only). The back of the iMouse S60 has a slot that holds the wireless usb receiver magnetically. Never again will you have to worry about losing these tiny usb dongles. With two selectable DPI options of 800 and 1600, users can change their desired DPI settings for different applications. Optical sensor technology improves precision and even lets you work on most surfaces like marble, wood and leather surfaces without the need of a mouse pad. With an optical resolution of 800/1600 DPI, you can browse comfortably basically on any surface.